As one of the trailblazers for the e-commerce driven, mattress-in-a-box business model, Casper remains a solid front-runner. Founded in 2013 and based in New York, the company has physical showrooms in both New York City and Los Angeles. Like some of its online competitors, Casper initially adopted a “one mattress fits all” approach; at first doing away with the traditional mattress industry’s tendency towards multiple mattress models to satisfy varying firmness and comfort preferences of potential buyers. Of note, though, is the fact that Casper has actually redesigned their flagship mattress several times since the company was launched; and recently even added two new mattresses to their product line: the budget pick Essential and the more luxurious Wave. Flagship mattress and namesake Casper is still the most popular, though, and is the subject of this review. The construction of the Casper mattress has changed over the years, and its current incarnation has it at its most innovative. This product appears to be the result of obsessive research and a carefully thought out design meant to provide a great night’s sleep to people of all shapes, sizes and preferred sleeping positions. The hybrid mattress is composed of four layers of different types of foam wrapped in a fire sock; and then encased in a hand-sewn, stretchy, and breathable cover that you can easily take off using a zipper. The top layer of the Casper mattress is an open-cell, high elasticity and high performance breathable polyfoam; meant to provide bounce, cooling and support. Before 2017, the top layer was instead the more familiar latex foam. The second layer is made of responsive, high density memory foam, which adds comfort, pressure relief and a slight semblance of that distinct memory foam mattress feeling of the bed conforming to your shape. The third layer is another kind of polyfoam—this time, transitional and of a proprietary nature. 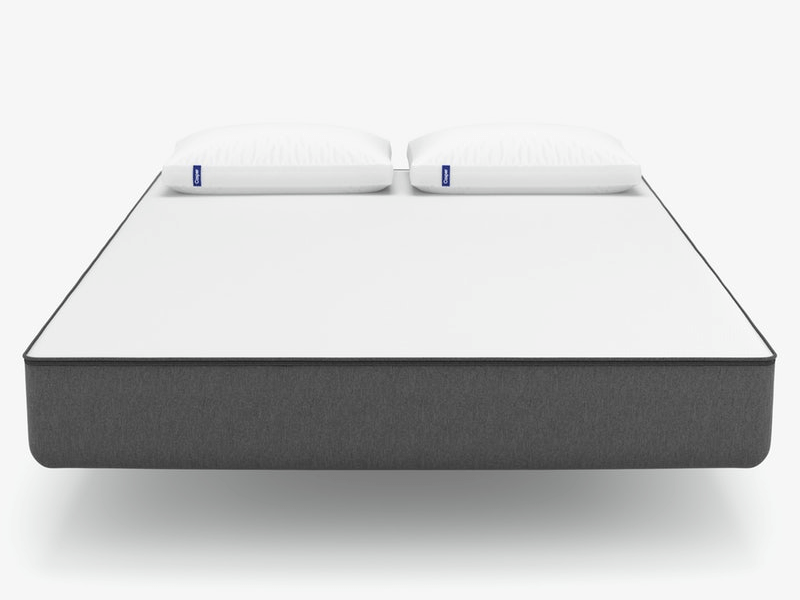 Casper designed this layer with what they call Zoned Support™; the function of which is to aid the mattress in providing deep comfort through maintaining good weight distribution. The transitional foam is softer around where your shoulders would be, and firmer around where your hips would be. The thick bottom layer of support polyfoam acts as a foundation and base for the layers above it, and provides deep support; keeping your body on the mattress and propping it up so you don’t sink completely into the foam. All in all, the Casper mattress cradles sleepers with 10 inches of CertiPUR-US approved foam that is further wrapped in two fabric covers. The first is a mechanical fire retardant sock made from silica threads. No chemicals here! Then, there is the custom-made and hand-sewn cover than you can easily take over using a zipper—a great and convenient feature, especially for cleaning purposes. The top and bottom fabric is white and 100% polyester, while the dark gray side paneling is made of a polyester and polypropylene blend. Worth mentioning here is that the simple, streamlined look of the Casper mattress has become an unofficial standard visual design when it comes to mattresses you can buy online. Mattresses from brands like GhostBed, Nectar, and Eight all emulate the monochromatic, minimalist feel. As mentioned above, Casper also has the Essential mattress and the Wave mattress. The former is much more affordable than the Casper mattress, but is more compact at only eight and a half inches thick; while the latter is more expensive but also innovative—with Hyper-Targeted Support™ and a more ergonomic design—and more plush at 11 and a half inches thick. If you are on a tight budget, or in need of exceptional comfort and support, it may be worth considering these two alternatives. The Casper mattress is the happy medium between the two, but it certainly is not meant to be a “one mattress fits all” type of deal—if it were, Casper would not have released the other two mattresses. The Casper mattress is available in six standard US mattress sizes: twin, twin XL, full, queen, king and California king. Its weight is comparable to the industry average; from the twin’s 44 pounds to the California king’s 90 pounds. The box it comes in seems to be very solid, too, as it add nine pounds to the overall weight of the package delivered to your doorstep. The best base for the Casper mattress is a firm and flat one, to maximize both lifespan and performance; so it’s best to stay away from flexible slats and classic box springs. Though firm and flat, the floor isn’t a great idea, either; apart from sanitary and health concerns, it can trap heat and moisture in the foam and possibly be a cause for a voided warranty down the line. 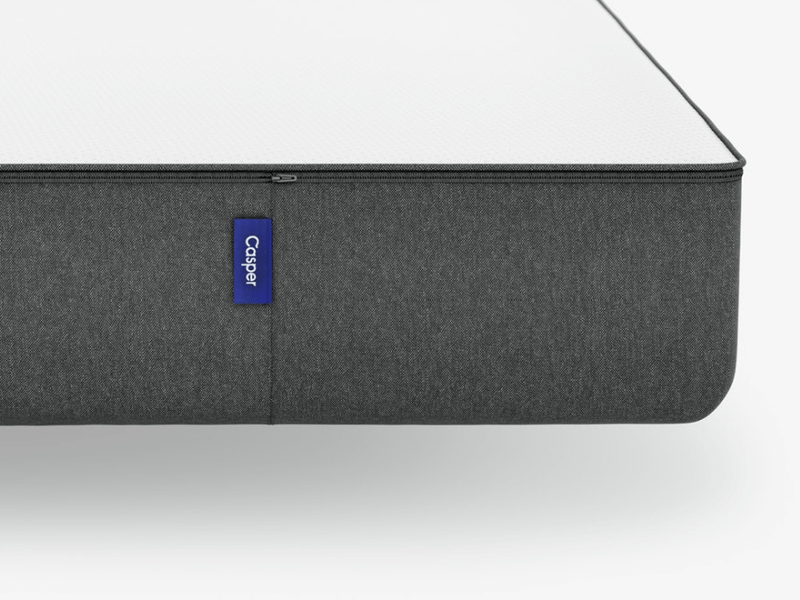 Of course, since Casper also has a box foundation that has been designed to perfectly fit with its mattress, the company recommends that as the best support structure; virtually guaranteeing warranty coverage. Because it’s marketed as an easy, online mattress-in-a-box purchase, there’s really no expectation that delivery will be anything but front-door service. That is, delivery men will bring the package to your door, and from there it’s your responsibility to bring it in and set it up. There is a white glove delivery option for buyers in New York, Los Angeles, and San Francisco—meaning you can request for same day delivery, unboxing and setup, removal of packaging material and even removal and recycling of your previous mattress and old foundation or box spring—though additional fees will apply. If you stick to the free shipping service, be warned that the box is heavy, though there are handles to help you carry or drag it. Worth noting: You don’t have to open the box right away. You can wait for up to three months before you actually set up the mattress. Later than that and compression will start to affect the product. Remember that the trial period starts at the date of delivery, too. Once you’re ready and the mattress is unwrapped, it will start to expand very quickly; you can actually lie on the mattress within minutes of opening the box. However, they may be a mild scent left over—as with many new things that come in a box—so it’s a good idea to wait anywhere between a few hours to a whole day for this odor to dissipate. 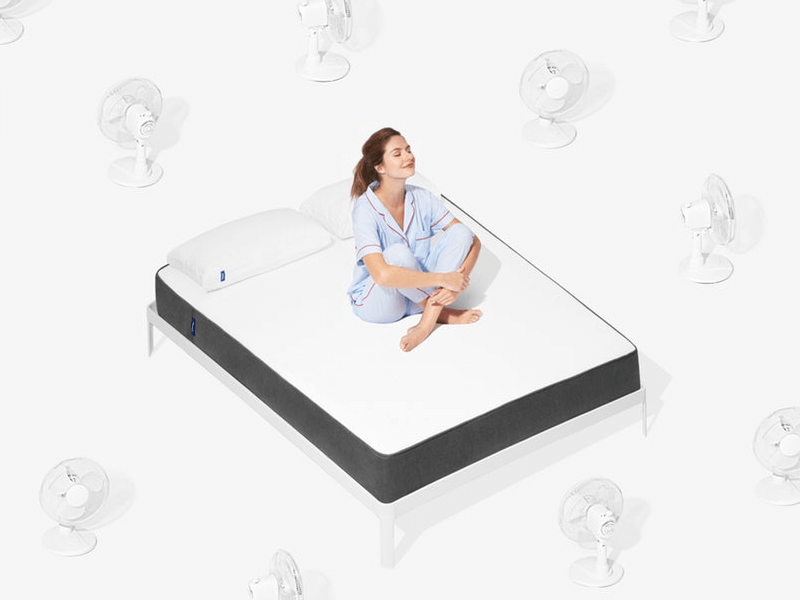 Casper claims that its mattress design has no weight limit, though it does recommend that the mattress be rotated every four to six months especially for sleepers that are heavier and larger; likely for even weight and wear distribution. The hybrid multi-foam composition makes for not much heat transfer or motion transfer, but edge support could be better. It’s apparent from customer-written mattress reviews on the product website that there is an overwhelming amount of sleepers that have found the Casper mattress to be, in Goldilocks’ words, “just right”. However, it is worth noting that negative reviews—though few and far between—do exist. One thing that makes gauging this tricky is the company’s constant revamping of the flagship mattress design. How many of the reviews online are working with the current incarnation of the Casper mattress? It is impossible to tell at a glance. 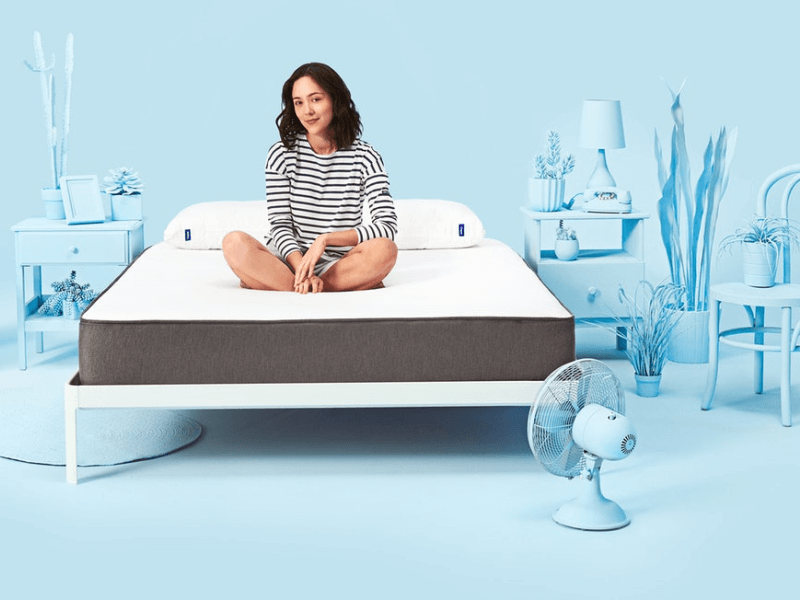 Even though it’s one of the earliest to initiate a shift in the mattress industry from showrooms to online stores with free shipping, Casper isn’t that much more established than their competitors. What it does have, though, is name recall and acclaim—built by a fantastic marketing and advertising campaign that operates out of the box, if you’ll excuse the pun. It may or may not have something to do with the fact that Casper has had some well known celebrity investors; including Ashton Kutcher, Tobey Maguire, and Adam Levine. It’s also worth noting that Casper’s customer service is easily accessible; unlike some competitors, they offer live chat, and the responses are fast and helpful. The quirky and tone and identity that Casper cultivates catches people’s attention and adds to its positive reputation. For example, the Casper mattress is somewhat famous for being the first thing influencer and reality TV star Kylie Jenner unboxed when she moved to her new home. The Casper mattress was also highly visible and much talked about during South by Southwest (SXSW) 2017, beating out typical standouts like musical acts and mobile apps. Currently, the company is enjoying a lot of buzz due to its newest, off-the-wall product: the Casper dog mattress. Buzz and fame, however, cannot replace the kind of reliability and durability that can only be proven and tested by time. The Casper mattress, while quite popular, does not have an estimated usable life span that is backed by anecdotal evidence—simply because it hasn’t been around for long enough. Thankfully, a 10-year limited warranty ensures that the Casper mattress will be around for you for at least a decade. Before you worry about the 10-year limited warranty, though, there’s the 100-night trial. It is Casper’s version of a simple, post-purchase, and risk-free return policy for its customers. While you can’t try the mattress before you purchase it, this policy makes sure that you will never get stuck with a mattress that you don’t like. The return process is painless and guilt-free. If you find that the Casper mattress is not for you, all you need to do is to contact Casper. The company will arrange a pickup and have the mattress donated to a local church or charity, or sent to a recycling facility; after which Casper will process a full refund. As of this writing, the queen-sized Casper mattress is available for $995 with free shipping (if you’re in Canada or the US) and an estimated delivery time between two to five business days after placing your order. Returns are processed for free. Casper’s 100-night trial, risk-free return policy, generous 10-year warranty, and accessible customer service more than make up for the fact that you basically need to purchase the mattress before trying it out. 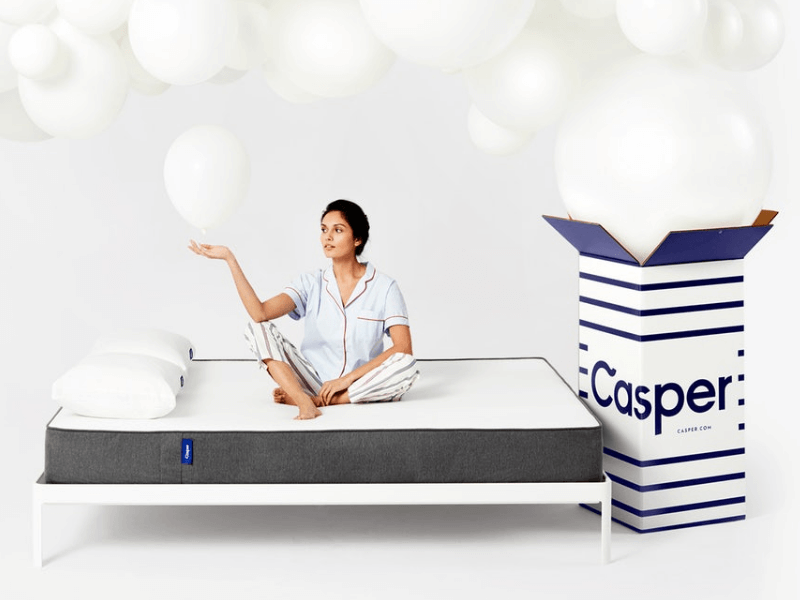 Casper has not been resting on its laurels, having continued making changes to its mattress materials and construction way past the company’s initial launch. While some may find this inconsistent, we find it commendable and indicative of a real desire to put out an exceptional product. Should the mattress fall short of its promise when it comes to you—as comfort is, after all, a personal preference—you not only have options to return the mattress, but also hope that future versions of the mattress may be a better fit for you. You can also try one of the other two mattresses in the company’s product line. It seems that Casper is always looking to improve itself, at an almost obsessive pace. The company sought to disrupt the existing mattress industry, and it has so far been successful.